We integrate Sign Language throughout the day in the infant room, and that foundation will become a spring board for a broader based vocabulary introduced in Toddlers. 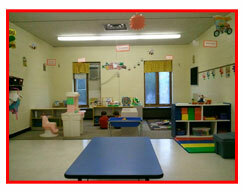 The Toddler room also opens up the avenue of learning when introductory Spanish becomes a part of the curriculum. These early language skills give your child a great head-start going into K-12 education. Our infant & toddler rooms are staffed with caring, friendly, experienced teachers at or better than state mandated student to teacher ratios. We work closely with your family as it relates to specific nutritional, allergy, & general care needs of your child. Please see our FAQ to read about specifics. Since the infant room is usually the parent's first experience with childcare, we strive to be a comforting presence in parent's lives. We strive to help the babies reach their developmental milestones, including rolling, sitting, crawling, standing, and eventually, walking. The classroom provides a warm, nurturing environment where each baby is special and babies are encouraged to explore and develop new skills at their own pace. Equipment and toys are safe and age appropriate. 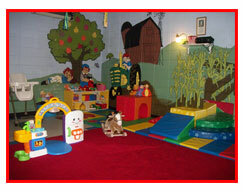 The room arrangements satisfy individual needs by allowing space for eating, sleeping, and playing. The infant room schedule allows flexibility to meet each child’s needs as well as leaving room for some planned activities. It also facilitates the infant’s curiosity and promotes self-learning, which aids mastery of the skills necessary for problem resolution. Sign language is an integral part of their day throughout as they learn about the things in their environment. They also experience their own gym time once they are able to start moving about. Opportunities for them to be able to use their creativity are introduced through many art materials which primarily include food soluble substances i.e. pudding, baby food, cool whip etc. On some days, all that might be required is a diaper, as they will dive into creative expression using their whole bodies to paint. Naturally, we believe that your infant’s best moments will be spent with their teacher, as that is truly their most favorite “play thing”. David’s supports the Primary Caregiver theory 100%. This is where each child’s primary care needs are met with the same staff person in order to form a bond between the two of them. This assists in easing some of the normal struggles an infant might have such as separation anxiety or attachment issues. The infants receive care that is specific to their needs and schedules from their primary caregivers who focus on each child as an individual. Frequent communication between caregiver and parent coordinates home and center routines and develops close relationships between center staff and children and their families. A balance of sameness and variety is maintained within the room while attention is focused on the child’s play, sharing the excitement of each moment, and recognizing and giving praise for all accomplishments. Ages: 16 months - 3 yrs. Blocks and Balls, Push and Pull toys, Climbers and Clangors, and anything that looks like it might be edible; these are things that interest the Toddler. This is the age of great explorations and curiosity. Most seem to have a no fear policy about them as they explore their surroundings. Daily records; recapping the important items of their day are a must for this age group as they are still napping, diapering and discovering food likes and dislikes. We address the very active needs of the Toddler by providing a schedule that will satisfy much of their curiosities about the world around them. It has a balanced assortment of quiet and active activities and a forum for expressing their creative juices as well as opportunities for all the sensory experiences they need to be satisfied for a moment. Teachers provide that secure and dependable setting where warmth and nurturing abounds. As with our other classrooms, we address all the developmental domains of the growing Toddler by watching how they are progressing socially, physically, emotionally and cognitively. The Toddlers independence is encouraged in self-help skills such as sitting for meal times, eating with silverware, putting on their own clothing and outerwear, and assisting in their toilet training. We encourage the toddler’s emotional and social development by helping each child recognize and deal with the complexities and challenges of his/her feelings. This is accomplished by working on a trusting and loving relationship with each child. Showing respect, learning to share and helping one another is a doorway to developing caring relationships with adults and with their peers. Spiritually we find the Toddlers to be especially captured by the Bible Stories as their curiosity is even peaked further when stories such as David & Goliath, Noah, Daniel, and the Lion’s Den are introduced. A Toddler’s best mode of learning is primarily through play where they have opportunities for hands on exploration. Teacher directed activities are also integrated into the curriculum throughout the daily schedule. With dependable settings and routines in place, the growing toddler begins to feel secure in an environment where they will start to increase their skill and competencies and develop individually and with their peers. Sign language is continued in this room as we expand upon their vocabulary in that area. You will begin to see the use of some limited Spanish as we start to introduce this as a second language by teaching them their colors, shapes and some animals in Spanish.